Th e Grand-Ho Tram Strip, a luxury oceanfront tourist area and resort complex in Xuyen Moc District in Ba Ria-Vung Tau Province opened to visitors on July 26. 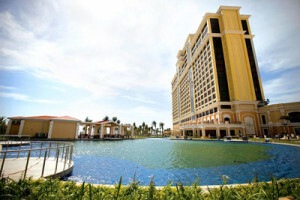 The resort complex has two imposing architectural towers. The first tower has 541 rooms, including a modern game lounge for foreigners, a conference center, ten restaurants and bars, a luxury spa, three outdoor swimming pools, and a shopping mall among many other features. The second tower includes 559 luxury rooms, which are still under construction. Grand-Ho Tram Strip is the first resort to have a casino of international standards.